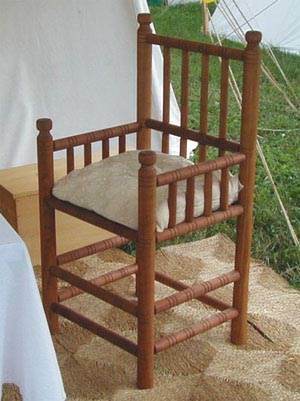 Building a chair can be a great challenge for a craftsman that wants to increase his woodworking skill and confidence. Whether you decide on a wing chair, captain's chair or even a kneeling chair, there are clear and concise wood chair plans to suit your style and ability. Many chairs require just basic tools and hardware, so they are perfect for woodworkers just learning their craft. Choose chair plans that fit with your skill level to produce a beautiful, custom-made chair that is sure to become a family heirloom. Use beautiful woods and stains to customize your creation, blending with your decor. Add an occasional chair to the bedroom, den or family room for extra seating, as well as decorating excitement. A custom wooden chair can be just the thing to perk up a lackluster corner, using bright paint or beautiful finishes. 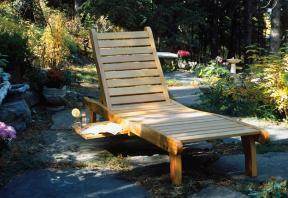 Follow these simple design plans and you will be lounging in the sunshine in no time with a sturdy reclining lounge chair. Easy to build vintage plans for a colonial wing chair done in maple. This chair stops you from slouching. This project should only take two days to build, finish and upholster. This chair is consistent in proportion and style with illustrations from the 14th to the 16th centuries. The Captain's Chair is a long-time favorite that is enjoying renewed popularity.